Heather Blakey, the creatress of Soul Food Cafe, is a remarkable woman, and she is fortunate enough to have the Raven as her Totem Animal. Raven represents the ability to go into the Darkness and bring forth the Light. Northwestern American Indians believe that Raven stole the Sunlight from one who would keep the world in Darkness, therefore Raven is symbolic of the Eternal Cycle of Life and Death. In Norse mythology Odin had two Ravens that served as his Messengers, their names were Hugin (thought) and Munin (memory). Because of their ability to mimic other animals’ sounds, Raven is associated with the ability to communicate, and is an extremely powerful creative Totem. An entirely appropos Totem for a woman who awakens the creative life of those who seek out her virtual Queendom of Soul Food Cafe. This entry was posted on 20/09/2007 at 1:23 AM and is filed under Bookworm Tales, It's In The Cards. You can follow any responses to this entry through the RSS 2.0 feed. You can leave a response, or trackback from your own site. Thank you so much Gwen. I have found this post very touching today. Deep bow of gratitude! 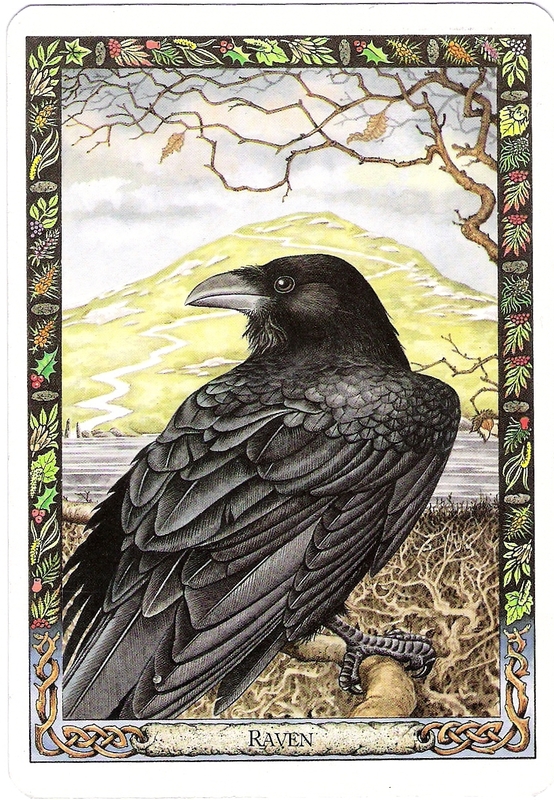 beautiful picture of a raven – is it the tarot card? That card has lovely artwork on it. Very interesting, the Raven, a bird featured in so much mythology. A fine totem indeed, for Heather.